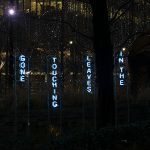 ‘The Garden of Floating Words’ commission for the 2017 Canary Wharf Winter Lights Festival, London. 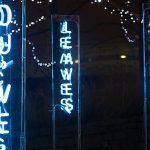 A cluster of glowing words forming a poem appear to be floating in the dark amongst the foliage of Jubilee Gardens. 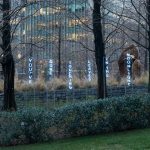 Using neon, a light source traditionally associated with the city, Artesero creates something more ephemeral to make a space for quiet contemplation on the dark winter nights. 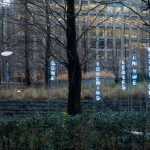 During the daytime the words are revealed to be on tall rectangular stands, their structure echoing the tall buildings of the surroundings; but at night the words become the main feature, giving the effect of floating words. Much of Artesero’s poetry addresses themes of transience, the nature of happiness and hope, and here is no different. 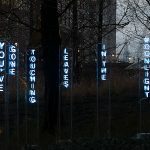 This thoughtful poem reflects the transience of the apparently floating words and their place in the garden.